A season that started out with two solid months for Kyle Tucker has turned scorching hot along with the weather. The Astros' second-ranked prospect went 3-for-5 with a double, driving in three runs and stealing two bases on Friday as Triple-A Fresno knocked off New Orleans, 5-1, at the Shrine on Airline. MLB.com's No. 14 prospect has 15 hits in his past 41 at-bats (.366) to raise his slash line to .288/.359/.484. In that time, he as a homer and six RBIs. The 2015 first-rounder struck out in the first inning, but singled to right in the third. After striking out again in the fourth, he singled up the middle in the seventh before delivering a bases-clearing double to right field to give the Grizzlies a four-run lead. The two-bagger gave Tucker 52 RBIs, tying him for second in Triple-A with Albuquerque's Josh Fuentes. Fresno teammate AJ Reed leads the Minors with 58. Reed homered for the seventh time in nine games, collecting No. 17 -- most on the Grizzlies. Tucker, who swiped his ninth and 10 bases Friday, nearly made the Astros' Opening Day roster with an impressive Spring Training during which he hit .409 with five homers and 21 RBIs in 44 Grapefruit League at-bats. The left-handed hitter instead batted .293/.371/.457 in his first month in Triple-A. 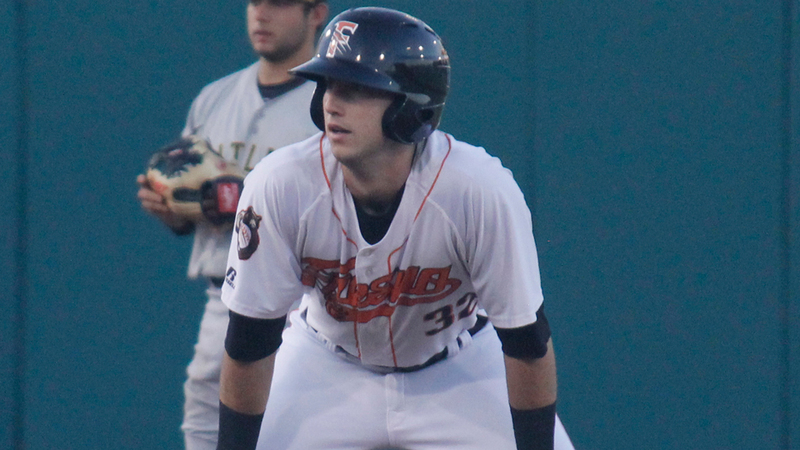 The younger brother of Braves outfielder Preston Tucker, he was selected fifth overall in the 2015 Draft. He jumped to the head of the prospect list with a breakout season in 2017, setting numerous career highs while hitting .274/.346/.528 with 25 homers, 90 RBIs and 70 runs in 120 games between Class A Advanced Buies Creek and Double-A Corpus Christi. Fresno right-hander Mike Hauschild (5-5) allowed seven hits and two walks, fanning four over five scoreless innings for the win. New Orleans righty and No. 12 Miami prospect Zac Gallen (4-3) took the loss after giving up a run on five hits and three walks while striking out six in four innings.